Don’t hesitate to bring all of your media content to this cool tab, but you should put your passion down first, for the Galaxy Tab S only offers space for compatible formats. Before moving your video library to it, go through its supported file formats first. To put HD MKV, M2TS, VOB, MPG, WMV, and FLV files to Galaxy Tab S, go for a Galaxy Tab converter first to make it possible to view unsupported HD videos on the tab. 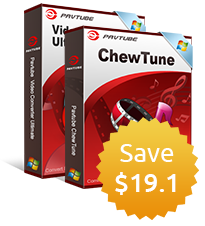 Pavtube Video Converter Ultimate can take in all these HD videos files and rip them to the format specific for Galaxy Tab S.
How to watch HD MKV, M2TS, VOB, MPG, WMV, and FLV on Galaxy Tab S with HD video quality? 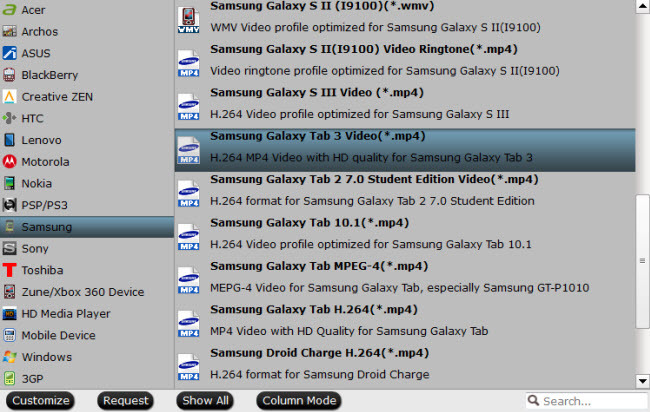 Launch Galaxy Tab converter on PC and click “File” to follow “Add Video/Audio” or “Add from Folder” to add HD MKV, M2TS, VOB, MPG, WMV, or FLV files to it. DVD sources or Blu-ray movies can also be brought onto Samsung Galaxy Tab S for maximum enjoyment with a specific Samsung Galaxy Tab S converter in Pavtube family. 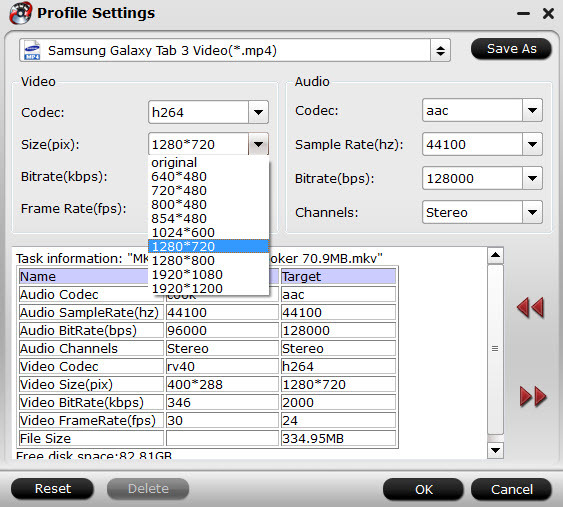 Click on the format bar to go to the format list to find “Samsung” option, and then choose “Samsung Galaxy Tab 3 Video (*.mp4)” as output. As Samsung Galaxy Tab S supports 1600 x 2560 resolution, you can change the default settings by going to “Profile Settings” windows to change video size to match your Galaxy Tab S. Other parameters like bitrate, frame rate, and channels can also be adjusted just for better entertainment on your device. Hit “Convert” on main interface to start ripping HD MKV, M2TS, VOB, MPG, WMV, or FLV files to Samsung Galaxy Tab S MP4 format. Samsung Galaxy Tab S is running Android system, so just use Kies to sync the converted HD MKV, M2TS, VOB, MPG, WMV, or FLV videos.